End of Titanic. Rose floating on debris, Jack in the water. You want to cry but can't. Philips' new concept jacket gives you a little hug (out of sympathy? pity?) and there go the waterworks. Philips senior scientist Paul Lemmens and a team of researchers have devised a jacket—but sorry dudes, no matching pants—that augments your emotions with gentle nudges, squeezes and taps. The point? 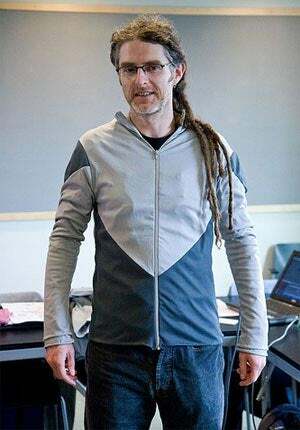 To cause "a shiver to go up the viewer's spine and creating the feeling of tension in the limbs," Lemmens told IEEE Spectrum, on the eve of the World Haptics Conference where he's presenting the jacket. The jacket's versatile fondling techniques come from 64 actuators, clustered in groups of four along different parts of the torso and arms—eight in each sleeve, for instance. They are low-powered enough to be run on two AA batteries for an hour, but hopefully they'll make room for more batteries, since the average movie is over 2 hours, including trailers. The signals to pinch your arm, tighten your chest, or sooth your back would come from the film itself, kinda like how those D-Box motion chairs follow pre-determined cues that are synced with the action on the screen.